It was another wait-and-see year for Atlantic Yards/Pacific Park, with one big twist--the beginning of a slow goodbye for the New York Islanders--but continued delays for towers, a lost (mostly) 421-a subsidy for condos, and new skepticism about unfilled not-so-affordable housing units. So ongoing questions linger regarding the project's pace, affordability, and even future ownership. In my 2017 preview, I predicted--not exactly going out on a limb--that two and likely three more towers would open, though it would be unclear how fast they'd lease up and sell. 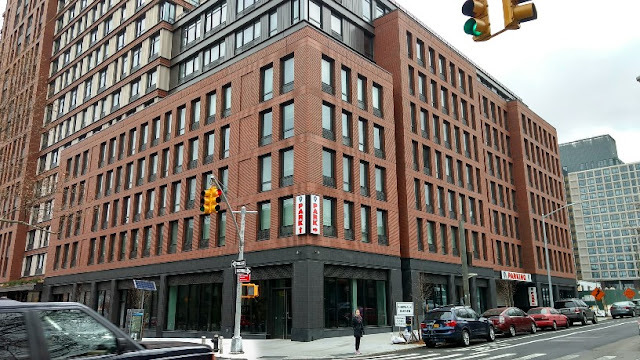 Indeed, we've learned that the middle-income below-market units at 461 Dean (which opened in 2016) and 535 Carlton have leased very slowly, while it's too soon to assess progress for commensurate units at 38 Sixth. (At 535 Carlton and 38 Sixth, middle-income units make up half the "100% affordable" buildings.) 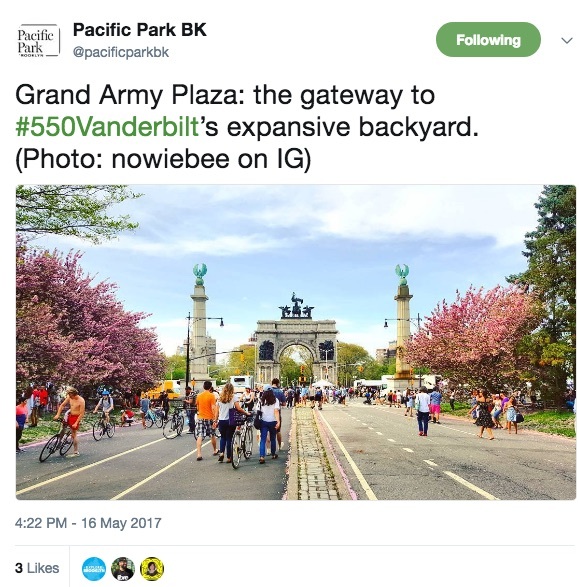 Meanwhile, many apartments are up for rent at the 550 Vanderbilt condo building, indicating absentee owners. The very beginning fraction of open space opened, outside 535 Carlton, with open space outside 550 Vanderbilt expected very soon. But it's a far cry from the "park" that's been hyped. Much of Atlantic Yards/Pacific Park remains unresolved, with the future timetable in question. Nearby, new places to eat and drink have opened and closed, but progress has been slow, with the most prominent retail space, at the former Triangle Sports site opposite the Barclays Center at Fifth Avenue, still unleased. No retail space has opened at the new towers, though the first potential tenant, Mekelburg's has emerged at 535 Carlton, not without controversy. The proposed middle-school in the B15 site, aka 664 Pacific, also remained delayed (though I'd predicted it would start). That said, infrastructure did proceed, including preparations for the deck above the railyard and the new West Portal to hasten passage of Long Island Rail Road trains to the Vanderbilt Yard. The demise of the 421-a tax break for condos put a significant wrench in Greenland Forest City Partners' plans, but a clever-but-apparently-legal maneuver, oddly linking two disparate buildings in a single "zoning lot," cut the cost of ownership significantly for certain units at 550 Vanderbilt, which had been selling slowly. Despite that savings, the developer had to cut prices--despite pledging not to do that. Three unbuilt sites put up for sale by Greenland Forest City remained unsold. The proposed giant two-tower project at Site 5, catercorner to the Barclays Center, remains unresolved, though New York City apparently proposed it as a potential site for Amazon's second headquarters, with no public process yet to change the project plan. That said, the emergence of the 80 Flatbush tower plan blocks away might "soften" opposition to large buildings that far down Flatbush Avenue. Seemingly contradictory statements by executives from Greenland USA and Forest City New York/Forest City Realty Trust (FCRT)--that new buildings would start, or not--suggested that the joint venture partners may not be on the same page. I had predicted, with no specific evidence, that tensions might emerge; as of now those statements are the only hints of evidence. On Forest City New York's end, however, Atlantic Yards may be diminishing as a priority. Parent FCRT announced it would sell 461 Dean, the once-pioneering modular building, at a loss to counter profit-taking elsewhere in its portfolio. Also, after jabbing from activist hedge fund investors, FCRT--already streamlining its operations to focus on office and residential space--announced a strategic review that could lead to sales, divestments, or other corporate changes. A rumor of one potential merger, with Equity Residential, surfaced. The Brooklyn Nets continued rebuilding, trading their longest-term player, Brook Lopez, to acquire a young potential star in D'Angelo Russell and later picking up Jahlil Okafor, another promising player who'd underperformed. The New York Islanders had a disappointing second season, which contributed to a significant decline in net revenues for the Barclays Center, in contrast with the arena's generally gaudy numbers regarding overall tickets sold. And while I predicted that the Islanders wouldn't pursue an expensive new arena but rather negotiate a new deal, they in fact won the RFP for a new arena at Belmont Park, purportedly "privately financed" but with questions about the land deal and other indirect public support. Atlantic Yards/Pacific Park seemed to be another vehicle for Mayor Bill de Blasio to claim victory, such as at a grand opening for "100% affordable" 535 Carlton, which drew much positive coverage. 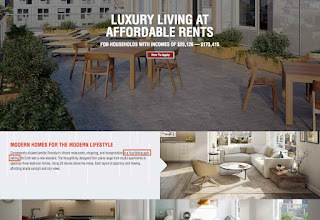 However, that ultimately backfired, as reporting by me and Rachel Holliday Smith of DNAinfo (as that publication closed) pointed to the numerous "affordable" units that hadn't been rented, leading to wider coverage, by New York Times Metropolitan section columnist Ginia Bellafante, of unrented "$3,700 a Month 'Affordable' apartments." Atlantic Yards was not an issue in the 35th Council District race, though Democratic challenger Ede Fox and then Green Party rival Jabari Brisport pushed incumbent Laurie Cumbo from the left on the Bedford-Union Armory. Cumbo won re-election. It would be tough to expect much more accountability, I wrote, and the long-promised Independent Compliance Monitor seemingly required by the Community Benefits Agreement still hasn't arrived. 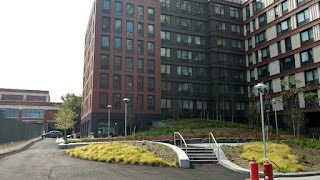 The Atlantic Yards Community Development Corporation (AY CDC), the board set up in 2014 (but which first met in 2015) to advise on the project, had added some transparency, but had been mostly toothless, I'd observed. 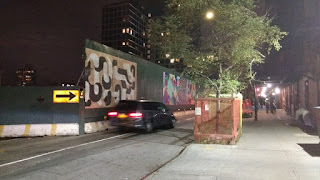 That continued in 2017, though the AY CDC did press Empire State Development and the developer on the long-lingering green wall on Dean Street, which--purportedly to protect neighbors from noise and dust during construction--encroached on traffic and pushed some parking to the curb. Finally, Greenland Forest City accepted reality, given that no new construction had begun, and agreed to move it back. In the category of "now you tell us," we learned that former Deputy Mayor Dan Doctoroff, despite his public enthusiasm for Atlantic Yards, actually considered the project a "crazy risk" for the developer, which raises questions about whether he should have safeguarded the public interest. Bruce Ratner joins celebrities in video asking Congress to fight Trump. Later, he does not publicly protest Trump's tax plan, which is quite generous to real estate investment trusts. Former Empire State Development Corporation (today known as Empire State Development) CEO Marisa Lago returns to NYC to head City Planning Commission. In the latest de Blasio affordable housing victory lap, the mayor says Atlantic Yards has been delayed "but the original logic still holds." Not so, as will become glaringly clear. "The real world is affordable is trying to find that sweet spot for a family that they can still afford to be here," de Blasio says, "and that’s very different depending on what family you’re dealing with." Once he said those earning six figures shouldn't get subsidized housing. It's unclear when the day care center will arrive at Atlantic Yards/Pacific Park. Would believe 38 Sixth Avenue is said to be "situated.... in a flourishing park setting"? So, is Greenland a government-owned entity? The local representatives won't say. The facts are that it is in significant part, even if it's publicly traded and not formally controlled by Shanghai, its largest shareholder. Forest City will sell its New York City retail portfolio, including the Atlantic Terminal and Atlantic Center malls, to Madison International Realty, which bought 49% in 2011. It's getting out of the retail business to focus on apartments and office space. The phantom Long Island Nets have played in a mostly empty Barclays Center, as it's not worth selling tickets. They'll move to the Nassau Coliseum after their debut season. Low attendance at Barclays Center basketball and hockey games leads columnist to observe that the arena faces "winter of discontent." Forest City's Gilmartin says return of 421-a tax break "will allow Pacific Park Brooklyn to continue." That turns out to be overoptimistic. Barclays Center rep claims low-rent Community Events program launched, but there's no evidence. Is Barclays "dumping the Islanders"? Despite Bloomberg report, questions remain. Though financial projections are ominous, that could mean renegotiation. Evidence varies. The Barclays Center fills up, but with Knicks fans. How many suites does the Barclays Center have? "More than 90," after The Vault was converted. It was once supposed to have 170, then 130, then 100 or so. Daily News editorial claims "technology to cover the rails" means towers "now rising... at Brooklyn's Atlantic Yards." Not so. Nassau won't get a minor league hockey team, as once promised, so they're betting--not necessarily wisely--on the Islanders' return. 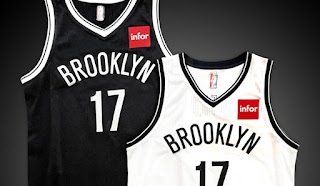 The Yormark-ization of the NBA proceeds: Nets sell jersey patch sponsorship to software company Infor. Skanska fires back in dispute over modular factory, says it "expected to assemble a properly designed modular building, not engage in an iterative R&D experiment." The legal dispute continues. Forest City New York CEO MaryAnne Gilmartin's goal: "deliver to Brooklyn" (er, investors) an iconic office tower. Number of affordable applications "reaffirmed urgency" of building 2,250 units, claims Gilmartin. But no new buildings have started, and the statistics will get scrutiny. Forest City/ESDC predicted 224-250 events at Barclays Center; first three years averaged 180-200. The Islanders did bring total to 240 events, though didn't necessarily bring profits. My TreeHugger article: "The World's Tallest Modular Building and the Phantom 20 Percent Savings," still claimed in some press accounts. Ratner out of power? City & State drops him from 2017 NYC Power 100 (after last year #45). The O&M bump: State official claims arena bond refinancing didn't benefit arena operator/Nets owner Mikhail Prokhorov, but it did. Regional Plan Association points to increased risk for displacement, especially in Brooklyn. Forest City Realty Trust goals: "Becoming the Nation’s Leading Mixed-Use Urban Placemaker" in "core, high barrier-to-entry urban markets." So, how many former footprint renters are returning in new towers? Forest City won't say (though 2012 article predicted 17). New report on Prospect Heights: incomes rise, racial mix flip, shift in concerns from education/safety to affordability/diversity. The Barclays Center's changing corporate partners (and the odd prominence of LIU). The irony! 461 Dean modular apartments hyped as "handcrafted locally. 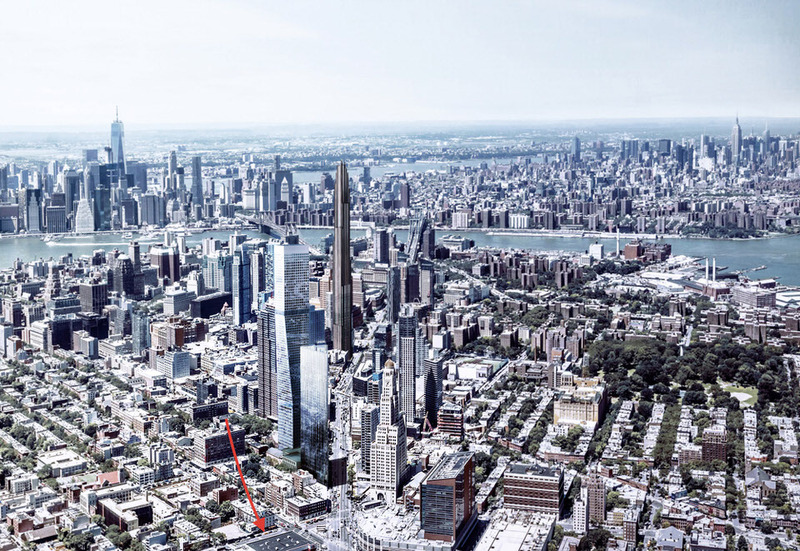 First five buyers at 550 Vanderbilt surface, including two from Shanghai and Forest City's Cotton. 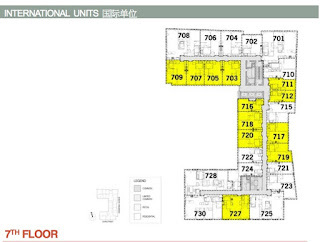 At 550 Vanderbilt, big chunk of apartments were pitched to Chinese buyers as "international units." Atlantic Yards CDC signs off on ESDC board extending environmental monitor's contract. Neighbors (and a board member) say monitor's just not effective. Despite pageantry for revamped Nassau Coliseum, some uncomfortable truths (and a deceptive name, "NYCB LIVE, home of the Nassau Veterans Memorial Coliseum Presented By New York Community Bank"). Ratner called it an “iconic” venue that “would rival the Eiffel Tower." Prokhorov's Brooklyn Sports & Entertainment partners with AEG to acquire Webster Hall in Manhattan. Proposed 80 Flatbush project a huge increase in bulk over Downtown rezoning; harbinger of Site 5 project? Proposed 80 Flatbush to the west of Williamsburg Bank clock tower. Arrow points to Site 5 location. Daily Beast: local coverage in NYC declines, most crucially in the Times. "The state of local reporting in New York City is at the lowest depth that I have experienced since I started as a reporter in 1974, and it’s not healthy in the long run for New York City to have a weakened media,” Daily News editor-in-chief Arthur Browne tells Paul Moses. 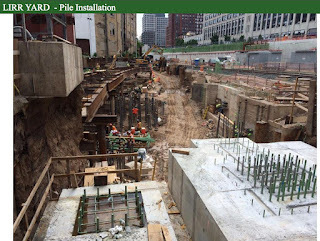 Two 550 Vanderbilt articles: a homeless construction worker, a "farm-to-condo movement." Did the Community Benefits Agreement survive the Greenland deal? Yes, but only two organizational contracts, with the Downtown Brooklyn Neighborhood Alliance (DBNA), led by the Rev. Herbert Daughtry, and Public Housing Communities. Barclays Center now using Times "Living Large at Barclays" article to promote VIP experiences. "Expert" Andrew Zimbalist calls Brooklyn an example of sports facility as redevelopment catalyst. Doing the math on 550 Vanderbilt rents: out-of-whack for conventional investors. The expected revenue from renting, at least at current rent levels, would be insufficient to meet monthly mortgage payments plus common charges/taxes, assuming a 20% down payment. 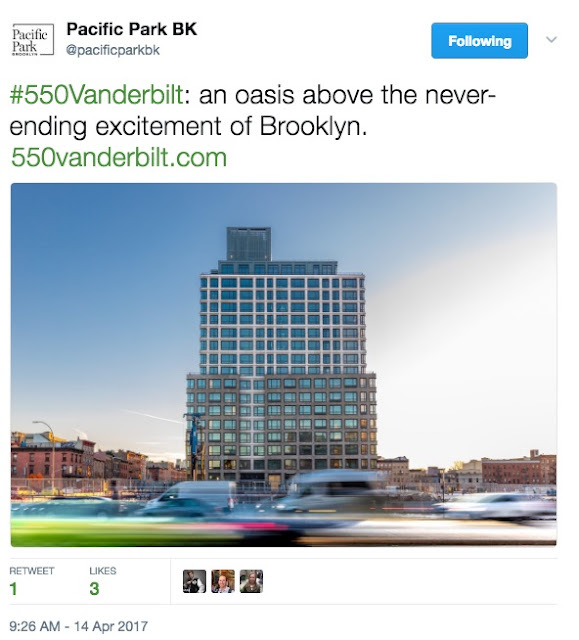 Is 550 Vanderbilt an "oasis above the never-ending excitement of Brooklyn," as claimed on Twitter? Only if isolated. The vista is very temporary. Exactly 92,743 households (not quite 95,000) entered the lottery for the "100% affordable" 535 Carlton tower, city data show. But only 2,203, according to City Limits' analysis, were eligible for 148 middle-income apartments, such as one-bedrooms renting for $2,680 monthly and two-bedrooms at $3,223, affordable to those earning six figures. About those "poor-er floors" in affordable towers: NYC says units redistributed (but new document not yet filed). No Surprise: EB-5 middleman a big donor to Trump's inaugural. 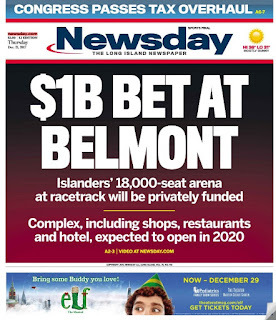 So, Islanders owners want a new arena at Belmont? How do the numbers work? 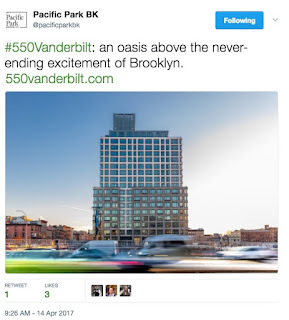 Irony: Prospect Heights Historic District used in tweet to promote 550 Vanderbilt (beneficiary of blight finding). Nets' TV ratings down, attendance up slightly, gate count reportedly up more (but 71% full). Legal case involving 664 Pacific and neighbor appears resolved, but plans for tower (and school) unclear. In Commercial Observer power list, Gilmartin is joined by LaRue (at #67), not Ratner. The name Forest City New York quietly succeeds Forest City Ratner. Gilmartin says units at a $1,500 per square foot represent a “sweet spot” in the Brooklyn market. Another tweet: "550 Vanderbilt fits right in with the existing charm of Brooklyn, while making a statement all by itself." Now, Dean Street neighbor Industrious claims to be part of Pacific Park. Scholar on EB-5: "It's merely serving to enhance the returns for those developers." Attitudes adjust in Prospect Heights toward Atlantic Yards: concern still high, but clearly diminished (and newcomers worry less). Without further 421-a revisions, major project uncertainties; condos wouldn't get tax break. The 2007 "Atlantic Yards carve-out," which extended the 421-a tax break to the whole project even if rental buildings contained no affordable units (as long as there were a minimum of affordable units overall), has apparently expired. Forest City announces 461 Dean 39% leased, 535 Carlton 21% leased, 38 Sixth supposed to open in second quarter. At a community meeting, a Forest City New York executive instead predicts "late summer" opening. 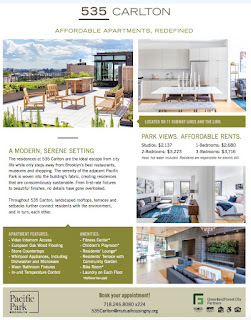 Market-rate studios at 550 Vanderbilt now at $2,200 a month, close to "affordable" 535 Carlton price. 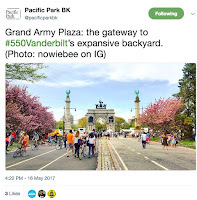 Definition: chutzpah: Grand Army Plaza claimed on Twitter to be 550 Vanderbilt gateway. If 10,000-plus people come to the Barclays Center for a Falun Dafa conference and no one from the arena announces it, does anyone notice? Yes. Numerous buses idled outside the arena. Plans emerge for 12-story building at former Church of the Redeemer site on Fourth Avenue catercorner to Site 5 of Atlantic Yards/Pacific Park. Times Plaza safety upgrades would include new pedestrian islands at Atlantic/Flatbush; open space plan, not applauded, comes later. The initial justification for the plan--first presented as a public space upgrade, then augmented with safety improvements after public pushback--is to offset an open space deficit for workers in the area. Why noisy, disturbing late-night work? ESD says it was last-minute request from Long Island Rail Road, but that ignores the lack of notice. Why not a 24/7 hotline to call with concerns? Catching up on an eminent domain debate: professor says if judges "should be especially suspicious of condemnations where the identity of the private developer is known in advance," that suggests "judges should encourage cities to raze whole city blocks before cities have a firm commitment from a specific developer." Another law professor says that a "genuinely well-planned" project "should be able to attract a variety of private investors willing to take it on simply by holding an auction." So, Barclays won't "make any significant design changes" for hockey. Anything else they could do? A new project: Atlanta's Atlantic Yards moves ahead. That means Brooklyn's Atlantic Yards should fade in Google results. If Forest City's financial model extends until 2035, when is it finished? A company project in Washington has a 14-month absorption. That suggests a 2033 finish in Brooklyn. Uncertainties mount: 421-a changes upend market-rate plans; "affordable" likely contains much leeway. Is the giant green fence really needed to mitigate noise, when there's no construction? State officials still say it's justified. Greenland and Forest City are out of sync: Greenland USA head claims two new buildings likely to break ground this year, though partner sounds more cautious. Forest City document: Bruce Ratner gets $450,000 salary in 2016 but no bonus or equity-based awards. In other words, he didn't have a great year. 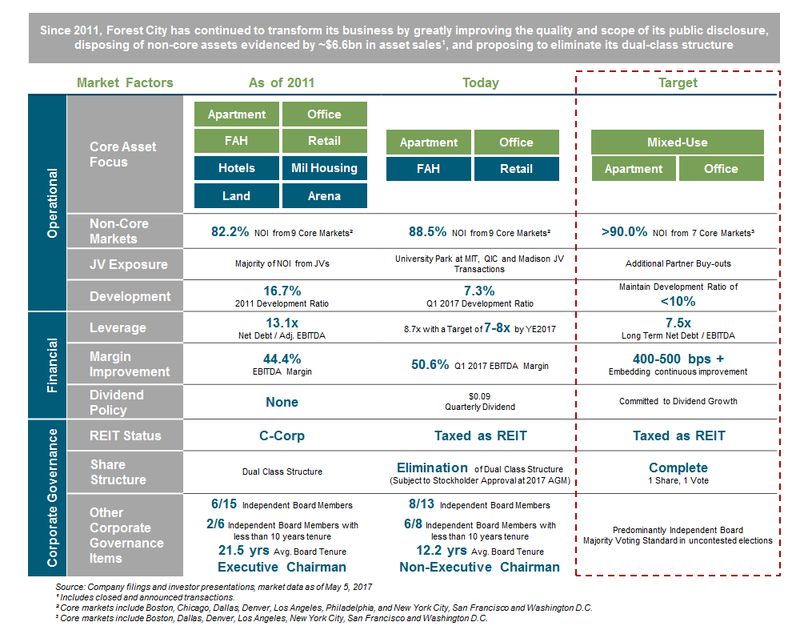 Forest City describes corporate transformation in letter to shareholders and chart. It also seeks "additional partner buy-outs" that would further reduce joint-venture exposure yet at the same time (per The Real Deal) may seek joint ventures to limit exposure. 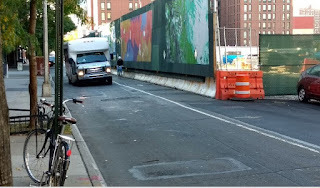 Another nonticketed event at Barclays: a rally at the Barclays Center for traditional Orthodox Jews requires cops and pedestrian managers--as well as staff working with the organizers--to get huge groups of pedestrians across Atlantic Avenue, at one point stalling all traffic. Year of the Sheep, again: public officials hail the opening of a "100% affordable" building which has half the units aimed at middle-income households who are hardly struggling for housing. The mayoral press release says "First 100 percent affordable building serves New Yorkers earning as little as $20,100, and up to moderate and middle income earners." Except only three units were made available for those low-income tenants. “Our administration is delivering on the affordable housing this community was promised," de Blasio claims, wrongly. Neither Bertha Lewis of the Black Institute or Jonathan Westin of New York Communities for Change, both supporters of the project but now critics of de Blasio and the lack of "real affordability" (though not at Atlantic Yards), appear in the press release. How exactly does Atlantic Yards Community Development Corporation oversight work? Board member is skeptical. Nets trade longtime center Brook Lopez and the 27th draft pick to the Los Angeles Lakers for talented but young/immature combo guard D'Angelo Russell and overpriced center Timofey Mozgov. I published comments critiquing Tackling New York’s Housing Affordability Crisis, by Ashley Cotton of Forest City New York, in Gotham Gazette. My full response: Pacific Park Developer's Deceptive Affordable Housing Spin. Yormark says the Islanders have been given "optionality" for their future home, including playing at Barclays Center plus Nassau Coliseum. Forest City cuts jobs nationally, including several in New York. This would represent the second New York downsizing in two years. "There are so many cases--in fact, there are cases where I'll sign a term sheet to make a deal, and we never do the final papers, we just do, this is binding, and we just sign it," Bruce Ratner says. "If you don't have a personal relationship with somebody, the documents do not mean anything." That could go both ways. Ratner also described some little-known episodes where he stumbled, including a 1992-93 "opportunity to do housing in Israel" and a digital retail company about seven years later. At market-rate units at 461 Dean, renters are getting three months free on a 27-month lease, paying an effective rent of $3,204 a month for a one-bedroom. The Wall Street Journal somehow calls the 461 Dean modular high-rise project "successful." It wasn't. 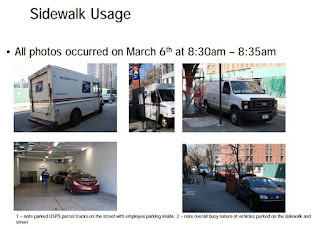 On Dean Street between Carlton and Vanderbilt, post office trucks, illegal worker parking, and giant green wall compound hazards, frustration for residents. Blight? 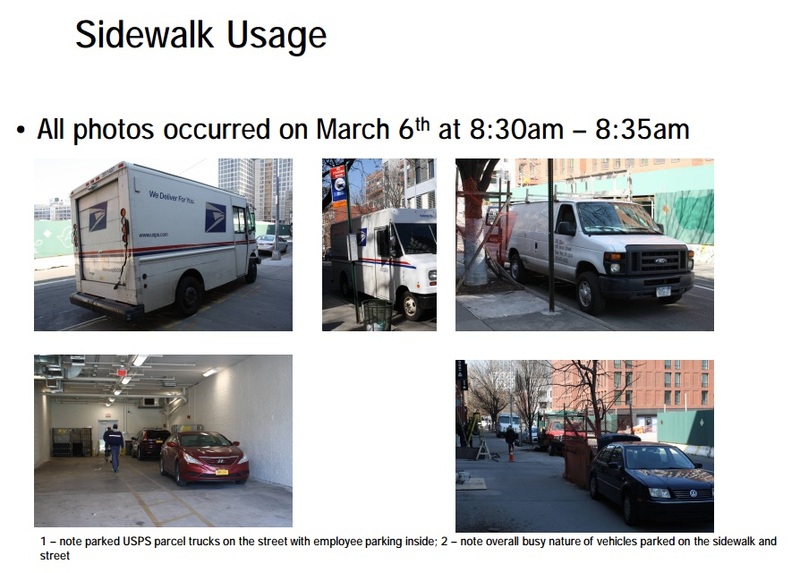 City DOT cites Empire State Development for sidewalk conditions (worse than those used to justify eminent domain). Long Island legislators, way late, now want renovated Coliseum retrofitted for Islanders. Greenland Forest City, facing slow condo sales, replaces broker, claims it won't cut prices: Forest City's Gilmartin tells the Real Deal 550 Vanderbilt wasn’t your “standard fare development project” and “We’re building an entire neighborhood." But 461 Dean rents were effectively cut. 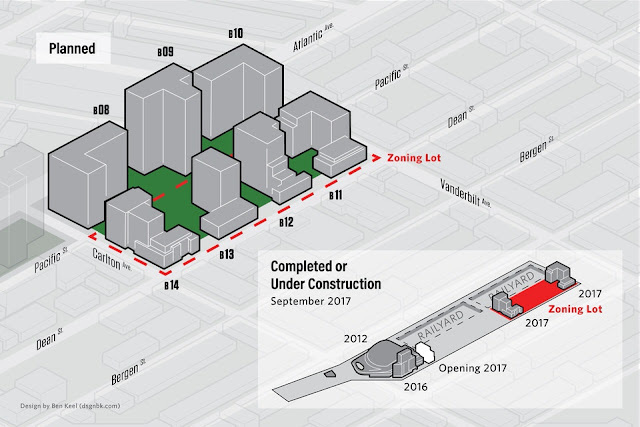 Developer is mum on new construction; full market-rate building now unlikely given loss of "carve-out"; three sites (B12, B13, B4) no longer being marketed. Greenland stumbles in Fortune Global 500 before rising again; top 100 ranking by 2020 seems doubtful (now #277 after rising to #258 and dropping to #311). The tighter financials suggest less reason for Greenland to be as patient or as generous as it once was regarding the project. It's official: Nets' new campaign is "Brooklyn Grit" (not promising wins). The tag lines are "Effort Means Everything" and "We Go Hard." The Real Deal reports on Pacific Park clouds: delays threaten 2025 housing deadline, and it may be tough to find investors. Real estate developer and former city official Seth Pinsky opines, without being asked about the penalty, that he wouldn't be shocked if the joint venture does not meet the 2025 affordable housing housing deadline. He doesn't have insider insight, but he does know the market's cyclical. Discussions over specific buildings or how much risk to take are “deliberate collisions that we intentionally knew we would be facing” and lead to a better project, claims Forest City's Gilmartin. Then again, "Several sources claim Greenland is unhappy about Pacific Park’s slow progress and that both partners would sell if they found a taker," reports Konrad Putzier. Some numbers: Forest City "has already spent around $725 million on the project’s residential portion and has written its investment down to zero on its books," according to Real Deal sources. From now on, any money it makes “is all positive” from an accounting perspective," according to analyst Paul Adornato. Forest City not signaling new towers, says "we intend to... be prudently cautious in our decision-making." Says CFO Bob O'Brien, "with hindsight, we also recognize that the size of individual projects and the total volume of activity we undertook, pre-Great Recession, put us in a higher risk position. That reality made it imperative that we take a different approach going forward." Former Prokhorov deputy Irina Pavlova says "we did look into" making Barclays "hockey-friendly," but Islanders' owner Charles Wang wasn't interested. He was expecting Nassau County voters to approve a referendum for a new Nassau Coliseum. Architect Rick Cook douses some hype, says Pacific Park buildings are "not a new neighborhood, but an extension to the existent neighborhood." "Inspired Urbaneering": Greenland USA's tagline (and web site). That's not an actual word. The less controversial and complicated Metropolis project in Los Angeles gets billing over Pacific Park Brooklyn. In the 35th District Council race, with former rival Fox challenging incumbent Cumbo, Atlantic Yards barely an issue. But it could be, given Cumbo's statement on Atlantic Yards-related sexual harassment and her enthusiasm for not-so-affordable housing. The bigger issue has been the future of the Bedford-Union Armory. ESD names Holly Leicht, a former city and federal official, as Real Estate EVP; she'll oversee Atlantic Yards/Pacific Park. The evolution of de Blasio, on affordable housing: "Our affordable-housing plan has a very substantial middle-class component. Now, some advocates don’t like that. They would like it all to be for low-income folks. I believe the mission is to reflect the historic mix that has made this place so extraordinary." Yormark is said to be victimized by Craig Carton's alleged Ponzi scheme; Boomer & Carton Kitchen at Barclays is kaput. Forest City Realty Trust says it's considering merger or sale transactions, among alternatives aimed "to enhance stockholder value." Hedge fund Land and Buildings' letter from April slammed continued family control. "The announcement of the expected dual share collapse has not yet led to the real change required at the Company to enhance value and drive the shares to the level of Forest City’s net asset value (NAV)," the fund said, calling for a "special committee of truly independent directors to fully and fairly evaluate strategic alternatives." 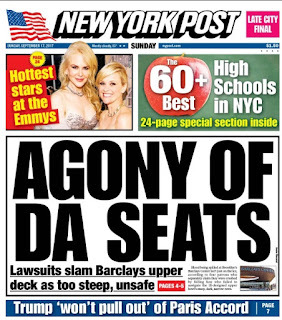 New York Post front-page: suits charge Barclays Center has too-dangerous steep seats. 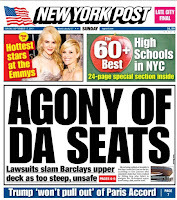 The Barclays Center--a rep told the New York Post--is among ten (of 30) NBA arenas with a steep 36-degree pitch. Unclear: how large the sections are with that pitch. In most sports venues (a category that includes more than arenas) the pitch is 30 to 33 degrees. Yes, Madison International buys remaining share of Forest City's New York City malls; considers roof deck and more food options in malls opposite arena. No update on construction timetable; developer admits B15 site "disgusting," cites partial progress in cleaning it up. Joint venture is still negotiating with a site neighbor about construction protections, so no construction start is imminent. Gilmartin says private companies have the advantage in the development game because they can make “long-game investments” and don’t need to focus as much on quarterly profits. So Forest City suffers? Though huge numbers sought low-income housing, middle-income affordable units at 461 Dean and 535 Carlton go empty, and are now marketed to new applicants outside the lottery. With increased 2017 Area Median Income (AMI)--from $90,600 (at 100% of AMI, for a family of four) in 2016 to $95,400 in 2017--income ceiling rises for remaining middle-income units. Indeed, the AMI rise from 2015's $86,300 to the current $95,400 represents a 10.5% increase in two years, which surely outstrips the stagnated incomes of the city's poor. At 550 Vanderbilt, Greenland Forest City holds 2017 Mid-Autumn Festival to sell condos. Project neighbor wants noise-reducing double-paned windows? Developer requests (but doesn't get) a gag order. "Block Party": Peter Krashes' paintings express community solidarity and neighborhood resistance/frustration. Here's the new one: "Power defines reality." 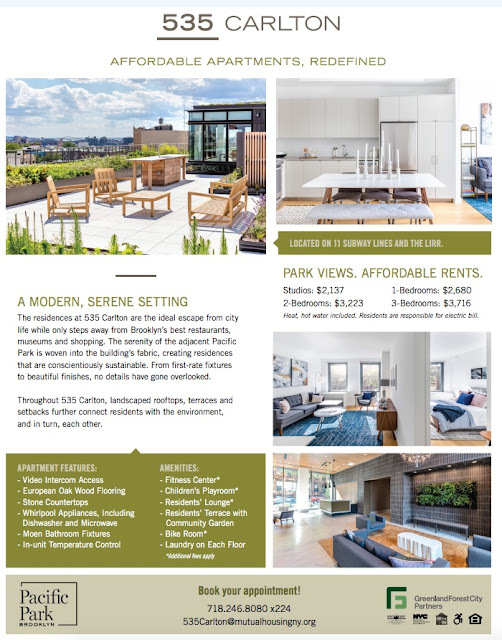 535 Carlton apartments pitched as "in the heart of Brownstone Brooklyn" We've come a long way from that May 2006 brochure: "A Vision for Downtown Brooklyn." At 550 Vanderbilt, Talk With Bravo Star Ryan Serhant at Brownstoner Open Houses. Attendees can tour a model apartment. The event is hosted by Nest Seekers and 550 Vanderbilt. After Yormark says hockey "economics just don't work," Islanders' owner asserts focus on Belmont. In September 2016, Yormark had told Newsday, "The playoffs represented a moment where we all said hockey has arrived in Brooklyn." Outside 535 Carlton Avenue, the fractional open space now welcomes the public. Deputy Mayor Alicia Glen claims that the "Atlantic Yards deals" represent "a better bargain for the taxpayer and the public." Yormark says, "At the end of the day, it’s great that your food is terrific, but artists want to make money." So "I have to keep an eye of managing our cost structure." In other words, money's tight at Barclays. Yormark says, "I do not think we need another venue nor do I think the market can support another venue." So now Site 5 (not ready for development) has been suggested as part of the Amazon HQ2 bid. At Atlantic Yards CDC meeting, no timetable for new buildings; will green wall be pulled back? ESD explanation for not moving wall back is questioned. So, four of 15 former footprint renters are now back on the project site. (Two of the original 17 signed private agreements.) Developer says it's "our goal" that all find a place in existing buildings. The time's unclear. 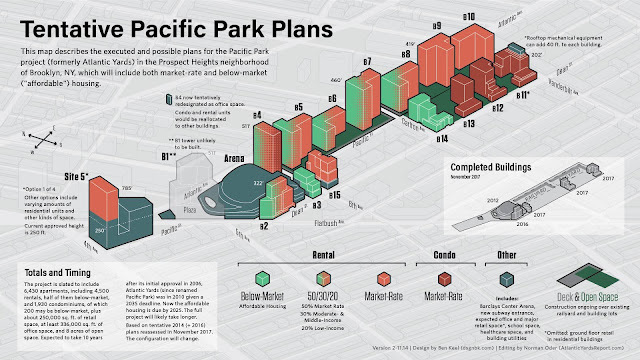 From City Limits: With 421-a Maneuver, Pacific Park Developer Could Save Buyers $50 Million More in Taxes. The developer wants to treat both affordable 535 Carlton and condo building 550 Vanderbilt them as part of the same zoning lot in order to enjoy a bigger tax break. 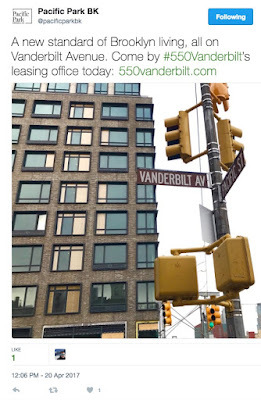 Boosting sales at 550 Vanderbilt condos, a stealth price cut (plus bizarre $1 tax claim). Overall, the 278-unit building's annual tax bill of $1.2 million, announced in the Offering Plan, was already a 69% discount, thanks to 421-a. Now it would plummet by nearly $1.1 million to less than $123,000, 97% off a $3.88 million tax bill. The solution was legal, but dismayed New York City officials. From Gotham Gazette: In New Books on Bloomberg and de Blasio, Unreliable Atlantic Yards History. Plus a revelation from Doctoroff: despite his public enthusiasm, he thought Atlantic Yards was a "crazy risk" (but considers it transformative). He also admits they chose to skirt ULURP for expedience. de Blasio's affordable housing re-set and the road not taken. Ismene Speliotis, the longtime low-income housing advocate at Mutual Housing Association of New York (and formerly New York ACORN Housing) would have been the city's housing commissioner if activist and de Blasio advisor "Jon Kest had lived," one de Blasio ally told author Juan Gonzalez. Now 535 Carlton middle-income units surface on StreetEasy. 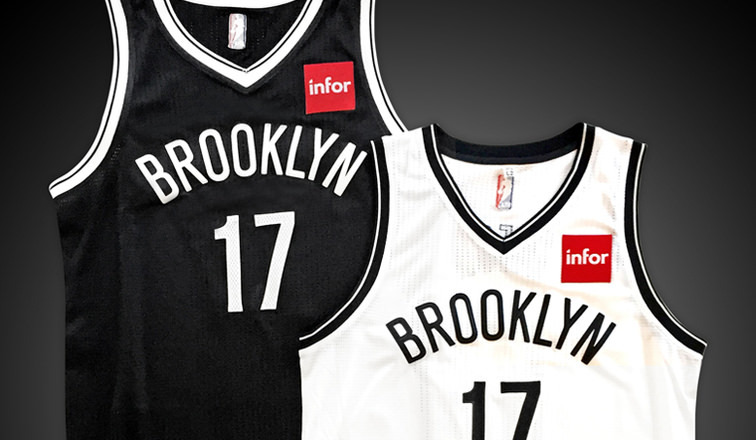 So, did Jay-Z propose the Nets' black-and-white color scheme? In new book, architect Pasquarelli claims credit. With new financial controls from China, "premature sales" of U.S. projects by Chinese developers? Forest City's Susi Yu at Brownstoner Open Houses networking event: “It’s a very different world today” in Brooklyn compared to a decade ago, she says. “You’ve got institutional money coming into this market. What’s important for Brooklyn is that we don’t lose our authenticity and core values that make Brooklyn so great.” Whatever that means. Forest City selling 461 Dean (only building they own 100%), plans to take tax loss of $44.3 million. Previously there was an impairment of $146 million, of which $38.7 million represents the write off of the factory. 535 Carlton is just 51% leased, which implies more than 140 apartments are available. Meanwhile, 461 Dean is 90% leased, a little more than one year after market-rate leasing began. DNAinfo (and City Limits) expand on my 535 Carlton reporting. 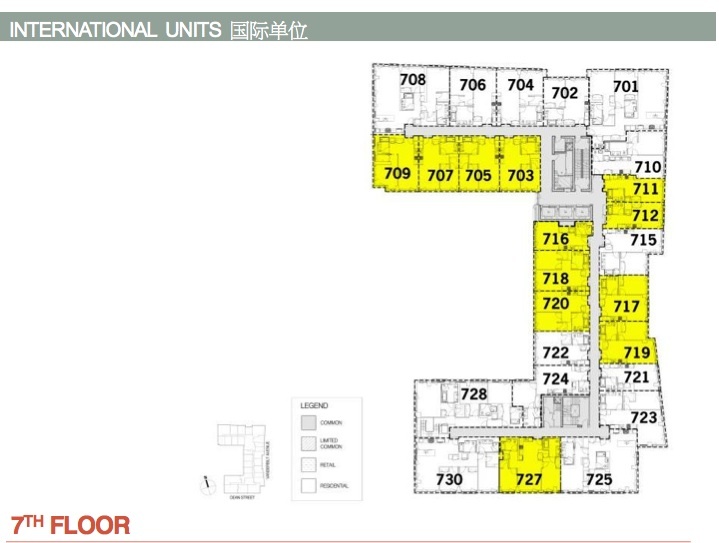 Rachel Holliday Smith reports that nearly 100 of the 148 upper middle-income units in the 297-unit lottery (plus a super's apartment) were not taken. Despite coverage of 535 Carlton lottery flop and qualms about expensive affordable units, some news outlets uncritically promote a "new generation" of affordable housing. As de Blasio cruises to re-election, new subsidies to build 1,300 condos and co-ops, extending affordability to ownership. Remember, there's a murky promise to build 600 to 1000 for-sale affordable units at or near the Atlantic Yards/Pacific Park site. Call it 600, with 200 on-site, with no timetable. Reuters reports that smaller Equity Residential approaches Forest City regarding merger. Conundrum: state official has no info on project timetable but says 2025 affordable housing deadline will be met. But if new buildings remain delayed, that May 2025 housing deadline gets harder to meet. Looking east on Dean St. toward Vanderbilt Ave. Developer says remaining green wall on Dean Street finally going down. Plans unclear for site next to 550 Vanderbilt. "I can’t tell you when B12 will move forward again," says Forest City's Cotton, who notes that "there’s a requirement for temporary open space if things are not working." Open space behind 550 Vanderbilt should be open by the end of the year. Barclays Center rep claims non-ticketed events not listed on neighborhood calendar for security reasons. That doesn't make sense. New York Post puffs 38 Sixth among "cheapest... chicest" housing; reality: 1,876 households applying for 152 costly middle-income units. My City and State op-ed, Simplistic Math Mangles the Odds of Affordable Housing Lotteries, points out that the chances within a lottery differ enormously, and middle-income applicants have a much better shot. Ripple effect in Brooklyn as Greenland USA pulls back on investment in North Hollywood, CA, project? The Real Deal notes that condo sales at Greenland's Metropolis project in Los Angeles, which includes three apartment towers plus a hotel, have been slow, and that Chinese developers have faced pressure from their government to limit their overseas capital investments. 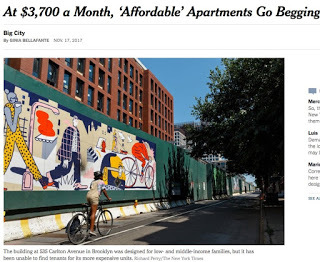 New York Times columnist Ginia Bellafante, without sourcing coverage from Rachel Holliday Smith (of DNAinfo) or me, notes that 535 Carlton "affordable" units "go begging"; missing is previous skepticism from me and others amid boosterism. Forest City's Gilmartin sounds diplomatic (or blasé): "It doesn’t matter much to me whether they [Amazon] end up at Pacific Park." A City Council bill would make affordable housing lotteries more transparent, but needs a finer-grained analysis of moderate- and middle-income households. The mayor tries to rewrite Atlantic Yards affordable housing history. Four-and-a-half months after announcing to The Real Deal that, with a shift in brokers to stimulate sales, 550 Vanderbilt would not lower prices, Greenland Forest City has lowered prices. Broker Ryan Serhant's defense of his role in selling formerly foreclosed Bed-Stuy row houses, "I was just a hired gun." Does that have Atlantic Yards echoes? It's not certain--no lease has been signed--but the major retail tenant at 535 Carlton, at the corner of Dean Street and Carlton Avenue, could be another branch of Mekelburg's, in 2019. Neighbors pushed back on a late-night liquor license as has Community Board 8. It's the first (potential) retail tenant to surface, though four towers have opened, so that's several spaces to fill. Empty neighborhood retail storefronts have several causes, but megaprojects like Atlantic Yards have been blamed. My article in The Bridge, The Uneasy Future of Islanders Hockey in Brooklyn. Barclays' net revenues, I report, were $18 million behind projections in the second year with the Islanders. Forbes: Islanders' slight value rise (still below price paid for the team) and operating loss drive bid for new arena. My follow-up in The Bridge, The Islanders Say Bye to Brooklyn, But Where Next? They'll play at least one more year in Brooklyn, but it will take at least one more year to build a new arena. So, maybe Nassau Coliseum, in part of in full. Questions about the financial deal behind the move to Belmont persist despite headlines calling it "privately funded." The lease value seems low. Yes, rats are still an issue in Prospect Heights. Forest City Realty Trust's profile continues to decline in its hometown, Cleveland. Maybe the Site 5 dispute will be resolved in 2018.